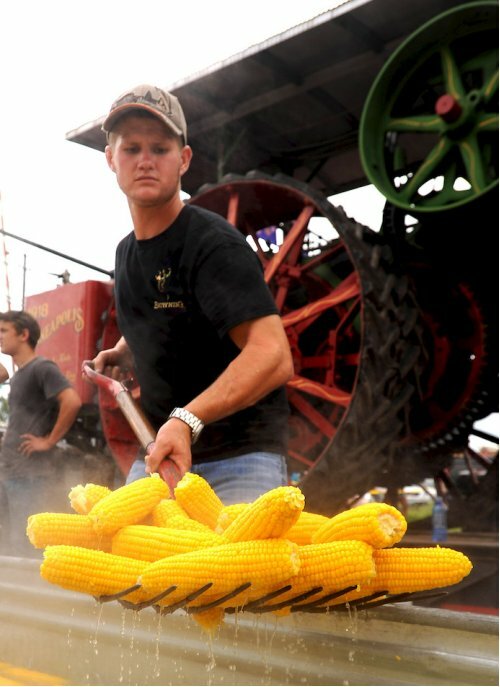 Austin Buehler of D. Ryan Tree Service pulls cooked corn from a boiler pan Aug. 30 during last year's Corn Boil. DeKALB – Alice Freier is set to “basically live downtown” this weekend as she prepares for DeKalb’s annual Corn Fest. Freier, who has been volunteering with the fest for more than 30 years, said the event is a lot of work – a yearlong project, with a lot of night meetings, not to mention setup and cleanup – but gives her a lot of satisfaction. DeKalb Corn Fest, a three-day festival that began formally in 1977, will be held in downtown DeKalb this year and will give the community a chance to socialize, enjoy carnival rides, partake in local food, hear live music and benefit community organizations, Freier said. Some of the money raised from the fest will go back to local nonprofits, which also will have a chance to promote their cause and raise money selling food or products. DeKalb’s Boy Scout Troop 33 takes part every year. It’s a fun opportunity to raise money and get a service project in, said Chad McNett, committee chairman of the troop and a DeKalb police officer. The scouts also will operate a food stand, selling brats, burgers and hot dogs, McNett said. This year, the scouts have added deep-fried Oreos to the menu and bought customized souvenir cups to serve Lemonade Shakeups. Mike Chamness, owner of Mike’s Empanadas, is returning for his second year. Chamness estimated he sold about 700 empanadas during the festival last year. Typically his food stand operates on a smaller scale at the DeKalb Farmers’ Market. The carnival will roll into town Thursday morning and road closures will begin at noon for Lincoln Highway, between First and Fourth streets and Second and Third streets, from the railroad tracks north to Oak Street, will be closed, as well as Embree Lot. Locust Street, between First and Third streets, will be closed after 3 p.m. Thursday. Friday morning, vendors will begin to setup for the weekend and Corn Fest will kickoff with live music at the sound stage at 5:30 p.m. Field Day, Back Country Roads and 7th Heaven will play that night. Throughout the weekend, car shows, live music and community acts, a free corn boil and kids events will take place. A full schedule is available at www.cornfest.com.